Personalised Family Ceramic Mug - Our Family Rocks! Are you one of those happy families that nothing can perturb? Then award yourselves one or more of these quirky 'Our Family Rocks' mugs. 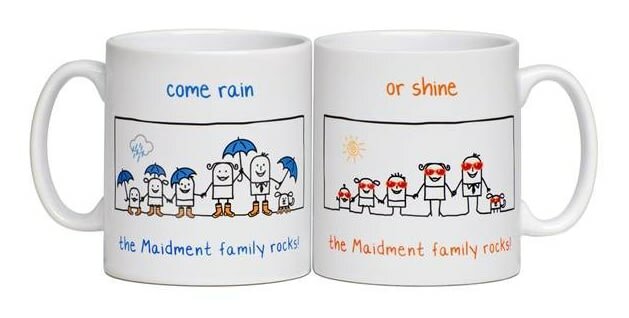 The cartoon illustrations are appropriate to the headings 'come rain' or 'come shine' and the statement beneath is personalised with your family name. The mugs are microwave and dishwasher safe and are scratch resistant. Blow your own trumpet and write nice things about your family for this family text message mug. Be as creative as you like and use txt spk 2 make the msge of gr8ter interest. Do you really love the area in which you live? Then have a street there named after you. Personalised with 2 lines of text. This custom printed Grumpy Cat Grumpy Family Emoji Cushion is an ideal accessory for the home.